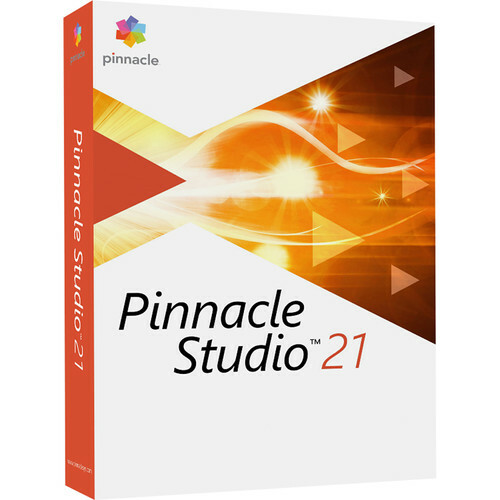 Bring your videos to life with Pinnacle Studio 21 Plus. Studio 21 Plus can handle SD, HD, and UHD 4K video, as well as 360 and 3D video. Whether you're editing video from one or multiple cameras or creating tutorials using screen recording, Pinnacle Studio 21 has the tools you need. New tools such as selective color, split-screen video, and wide-angle lens corrections let you enhance your video and provide production values not available previously. When you're ready to release your video, you can share online directly through Pinnacle Studio 21, or export to DVD with menu creation. Take your vacation, adventure, recital, and home videos and use them to tell stories from post-capture to export. Bring your focus to the spotlight and highlight a single color in your picture, pushing everything else to the background in black and white. Combine footage from 2 cameras to create more dynamic videos. Easily align and sync clips with audio syncing or with markers. When you're ready, select the angle you want to show as the video plays to create your own multi-camera production. Add music to your videos with the royalty-free ScoreFitter music library – it automatically adjusts to perfectly fit the length of your movie. Add motion to your still images or videos with simple controls for Pan and Zoom. Or, layer clips and add interest with easy tools to create a picture-in-picture effect or crop video directly in the preview pane. Save your finished projects as templates and fast-track future work. When your project is complete, you can go to 'File, Save Movie as Template' and easily replace media with placeholders. When your video is complete, upload your video to share with your family and friends on Facebook, YouTube, and/or Vimeo directly from Pinnacle Studio. Turn your production into a pro-quality disc with menus, chapters, and music or burn to DVD and AVCHD disc in a flash with customizable themed menu templates. A Blu-ray plug-in available separately. Customize your workspace and easily create custom shortcuts to edit your way and streamline your workflow. Extend your editing across dual monitors with new detachable windows. Create custom profiles and adjust screen resolutions. Organize your media and with a simple right-click, add your most-used effects to your favorites section. Box Dimensions (LxWxH) 7.6 x 5.3 x 1.5"